Glue small toy to center of cardboard, allow to dry thoroughly. Discard the base of wine glass. 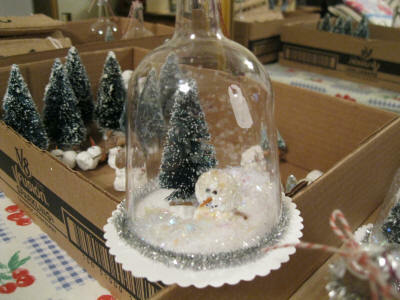 Turn glass upside down, fill with glitter, add glue to rim of glass. Turn the cardboard circle over glue to glass so toy is inside glass. Flip it over so it is upright. Let dry. Bend pipe cleaner to fit around base add more glue to secure glass to base. Add ribbon to top. Hang on tree. Snow globe can be flipped over again and again.